The main lake deep bite locations have become overloaded with shad and I can not find active fish. I assume they only need to travel a few feet and eat all they need in a few minutes. With the warm temps and calm conditions this morning, I decided to spend time scouting both main lake and creeks. I was able to find active fish in a creek. I did not find any big balls of shad in the creek , but there were small pods of shad from the mouth to the back. 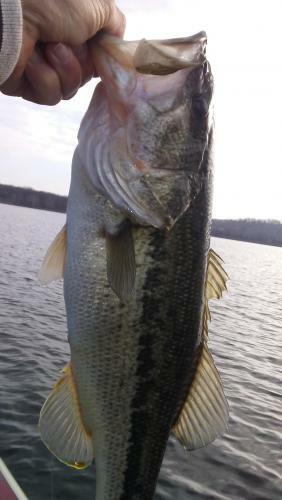 I caught fish on a ice jig, jerkbait, 4" grub, kastmaster casting spoon, and a under-spin with 3" swimbait. I only had 4 keepers, but that was my fault. I could not figure out the best bait/presentation. I am sure an a-rig would work. There is also a crankbait bite at least on the main lake, but I think you would have to run and gun and just hit the premium locations vs going down a bank. There are two LM pictures, one caught this morning feeding on shad and one caught yesterday on a crankbait with a crawdad in his throat. Notice the difference in girth, the shad eater has a full stomach. 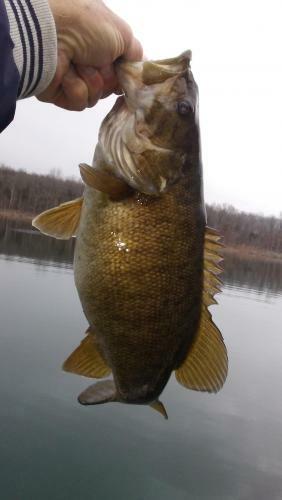 Good report and encouraging to hear of what could be the beginning of the prespawn crank bait bite. That K is a brute. The WT bumped up to 45. The feeding activity stopped at 10AM. You probably would not comprehend the potential of this location if you scouted it after 10AM. 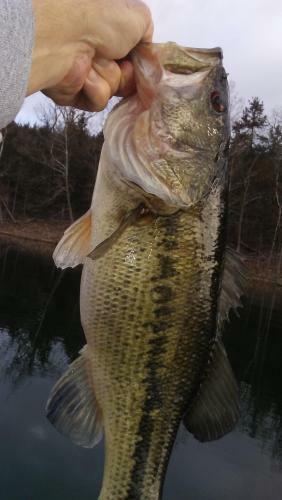 Been seeing some pictures from Bull Shoals and the A-rig bite is to the point of completely stupid with bags of 25 pounds and guys talking about catching 20 to 40 keepers a day. I'm guiding this week on Taney with the Missouri Conservation Federation and some of the other guides have completely gone crazy on Bull Shoals. It is at least 10 days ahead of TR. The amount of shad I fished around this weekend was absolutely unreal. I have never seen them stacked like they are right now. Some deep spots I was just reading shad to the point where it made it impossible to pick up any fish on the graph. The crazy thing is these shad were all about 30 ft down over 60-80 . So I pick up the motor and idle over to a pocket close to the swing I was fishing . It was the same thing except the bait was from 2ft under the surface like a blanket of slow moving thread fin. Stacked in the whole pocket all the way up to the bank . I couldn’t even throw a jerkbait without all three trebles coming back full of them . With this not working I decided to go all the way back in a large creek, I set the motor down and it was the same darn thing. Threadfin 2 ft down as far as I could see. In short I found enormous groups of shad from 60 ft all the way to the bank . From deep bluffs to the backs of creeks ! If you can’t tell I’m lost. Caught like 3 fish in two days . I will say this if you can find those spotted bass they are huge right now . It would be nothing for five of those suckers to go 15-17lbs . Bull has been on fire! for a few weeks now. Not just on the "stupid rig". Crankbait and jerkbait. Yeah. I haven't fished TR for 3 months. Just fished Bull and not with the same A-rig luck either. 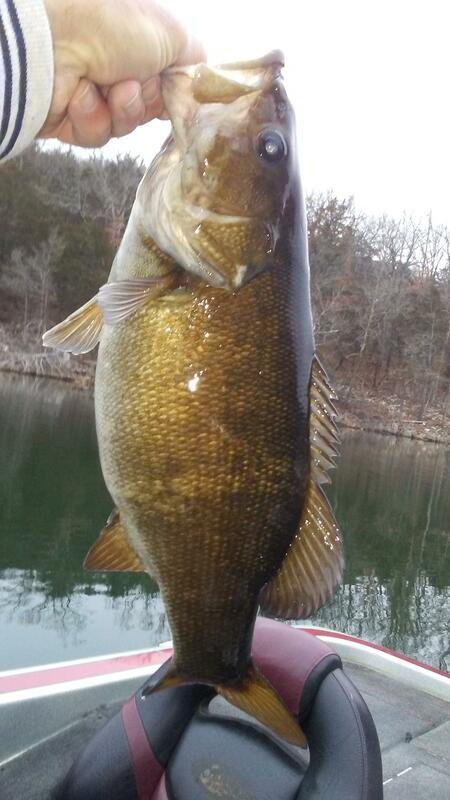 Most of my fish have been cranking. I had 6 keepers this morning (5 SM and 1 LM). All on the kastmaster spoon. I tried underspin, grub, and swimbait, but no bites. 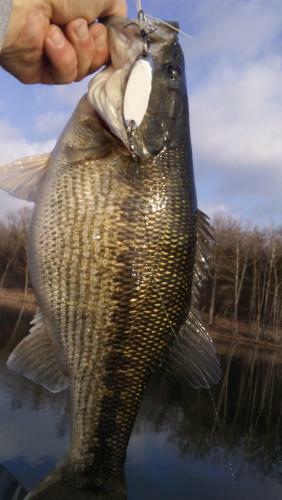 I tried the ice jig on some stubborn fish and realized the fish were better postured for a hortizonal presentation. The kastmaster works good when the shad are thick and you need a little flash to attract a few bites. The a-rig would have produced a lot more bites, but I thought i still needed a little more practice with old school baits. big and brown, just the way I like them !